What DIRECTV dish antenna type do I have? What kind of dish do you have? - A guide to identifying your DIRECTV satellite dish antenna. Note: The first digit is the number of inputs, second digit is the number of outputs. For example, a 4x8 multiswitch has four inputs and eight outputs. An odd number of inputs (3 or 5) means that there is an additional input for TV Antenna or Cable TV feed. Using the additional input also requires the use of diplexers, which separate the satellite and alternate feeds at the receiver drop point. Satellite signal is the primary feed on an output from a multiswitch, so it is not necessary to use a diplexer if you do not plan to utilize the alternate feed at any one receiver point. The SL3 SWM, has all the features of the standard SL3, with the addition of a single wire multiswitch. There is a single output on the dish, once ran into the building, the single line can be split up to eight times using DirecTV approved splitters. This system does not allow usage of diplexers for off-air TV reception or cable TV. AU9-SL3 Triple LNB K The SL3 3LNB mounts on the same dish that the original Slim Line 5LNB uses. It picks up 99, and 103 on the Ka band and 101 on the Ku. For most customers there is no need for the 110 and 119 and were used on the previous 3 LNB because DIRECTV is moving legacy HD over to 103 and 99. This increases the coverage area of the satellites so more people can get programming. The SL5 uses the Single Wire Multiswitch (SWM) technology to carry multiple channels of satellite signal down one line. Once inside the building you can split this up to eight receivers, something previously possible with cable tv. However this dish does not currently allow Diplexing since there is no off-air antenna input on the dish. The Slim Line dish is DIRECTV´s first 5-LNB dish, it receives satellites 99, 101, 103, 110 119. This dish was also the first to use the KA band by DIRECTV (satellites 99 and 103). It is called the Wide Band system because these new satellites run a lower frequency not previously used, and is also the reason you cannot use previous satellite equipment on it that passes 900-2150MHz. The Wide band runs on 250-2150MHz, which overlaps frequencies used by cable TV and off-air broadcasts. 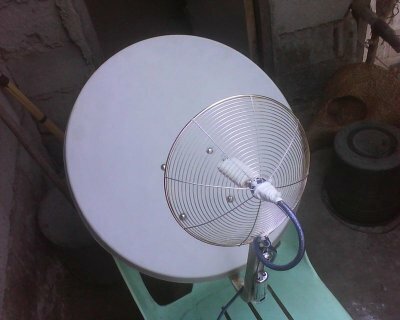 Diplexing, or the merging of CATV or off-air TV with satellite is not possible on this dish, because of the frequency conflict. @The Jim Roman Group: Need two new clients this week for DISH NETWORK or DIRECTV to sign up. Who is looking for satellite TV?